Do you have any better references for this pod? Something like a general arrangement drawing? I like the concept and it begs to be fabricated in scale. The BAE EXINT pods look a lot like the large bulbous nose fuel tanks that are found on the Mirage and Rafale. A simple conversion to reflect a different purpose with the addition of a porthole, door, and stabilizing fin would be a quick conversion to create an EXINT pod for the Harrier. I would still like to see something more on that other box shaped version, it appears to allow for side by side seating in the container which would dictacte something with larger dimensions to what you have provided. It would surely be a noisy ride and stress filled ride for the passengers in either version. 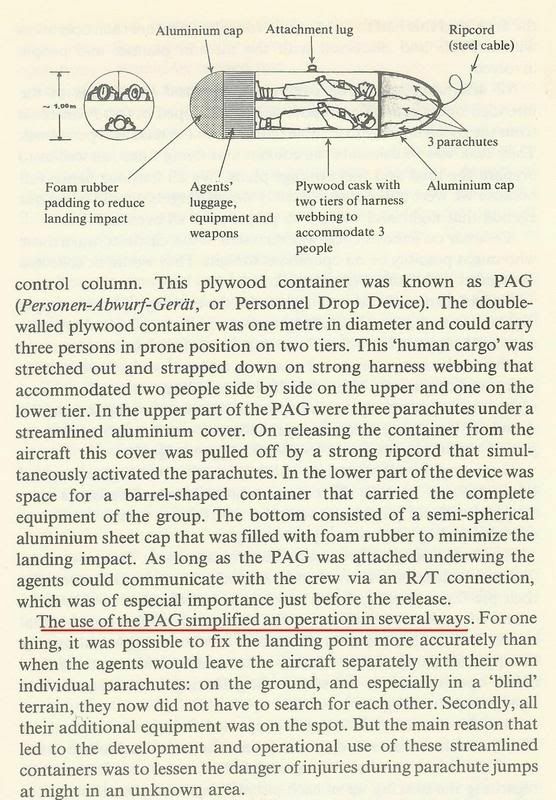 I also understand KG200 used a simular system to insert spies, dropping them by parachute in a sealed pod! The pods were trialed but not operational. They found after tests that the end result was rather dramatic to say the least and personnel were spared the trouble. Fair enough too I guess. Pretty much everything I'd read about the concept mentioned that there were fatalities during testing which led to their abandonment. How would you guide it, Duncan? Sounds almost like going back to assault gliders like the Horsa. Attached are several reference images. The first of which provides an overview of British developed cargo containers that were used to supply airborne troops and partisan groups during WWII. Do you have any idea when this type of resupply container was dropped from use? I liked the versatility of this type of container since it could be carried by bomber and fighter aircraft on standard bomb racks providing an advantage in the size of the aircraft required as well as the amount of equipment and supplies to be provided in one drop. Image two is the label that is provided in the 1/35th scale Resicast supply container set. Very expensive but it does provide several types of supply containers including the wicker basket type which predates the metal and fabric covered designs that were developed during WWII. Image three shows a C-47 Dakota in flight with six cargo containers rigged for drop. The containers are constructed of heavy canvas instead of metal. These I believe were the American development to cut costs and save on war critical materials. Image four is the CTU-1 or the later CTU-2 Aerial Delivery Container. Both of these are constructed of a lightweight material. Not metal and not fabric, the technical manual describes destruction of the container by burning so what ever it is, it will combust with the right application of accerlant. This container is large enough to hold an average human but it is not cleared for such operations with personnel. It is designed for carriage on any standard 14.0" bomb rack capable of holding the weight of a full container. It has been tested on the OV-1 Mohawk as well as the A-7 Corsair so it has a wide range of delivery options. I have an aftermarket set of "personnel pods" for a Ju-87 Stuka that sat on top of the wings. Sorry I don't have a picture to post, but William Green's "Warplanes of the Third Reich" has some. They were like a little bubble canopy where two people would be sitting, and then encapsulated. There were even "windows" on the sides so the person could see (maybe that was to avoid airsickness-- rather a bad thing when tightly enclosed in a pod!) The pods were to be detached and then parachuted. Apparently there was a problem of trying to detach them simultaneously (sequential separation would probably nearly spin the plane around!). They were not used in operations. Might be nice for "museum rides"!! There is a user Manual avialable on the web... Anyway I understand that this can be launced out of the back of a C130. http://www.atairaerospace.com/smartbombs/ - who needs fast jets! I believe there was also a supply pod developed for Special Forces resupply during the Vietnam war that used a napalm container, the idea being that if the NVA/VC were to find the item, it couldn't necessarily be considered as a supply point rather just some nape that failed to detonate. What you are describing sounds like the baggage pods that were converted from fuel tanks and fire bomb casings. The attached image of the BLU-10 250 pound fire bomb is very close to what was provided in many of the 1/48th scale Hasegawa F-16 kits which had a door engraved in the side of the pod. Other pods were fabricated from the 150 gallon and 300 gallon Aero fuel tanks that were common to the A-4, A-1, A-6, and AV-8. Again like the BLU-10, a hole was cut in the side of the fuel tank and a door fabricated to fit the portal. There is an image of one such baggage pod hanging under an F-14 in the Squadron In Action book on that subject.